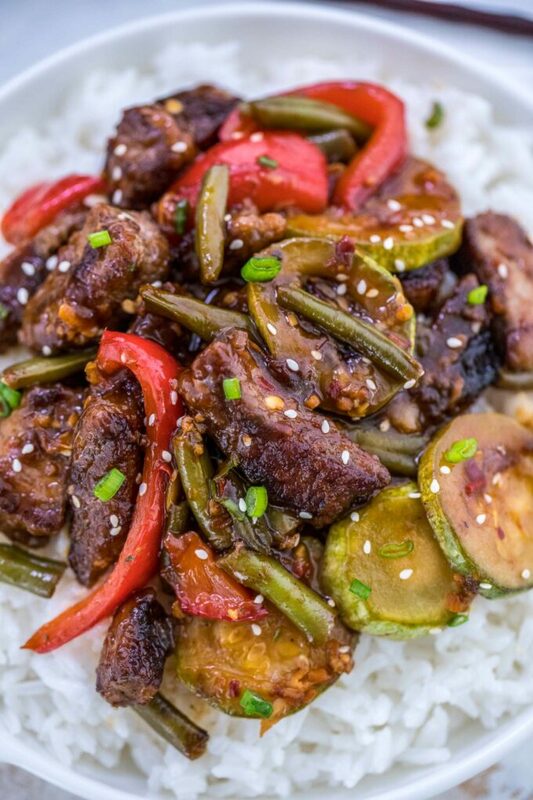 Hunan beef is an easy recipe made of crispy lean beef seasoned with spicy Asian flavors. It is the perfect Chinese dish that tastes better than restaurant take-out, and ready in less than 30 minutes! This savory dish is best paired with steamed rice or veggies. 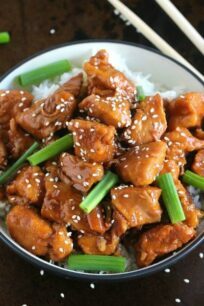 Other great Asian dishes to try are Instant Pot Mongolian Chicken, Honey Cashew Shrimp, or Slow Cooker Beef Teriyaki. Hunan beef is a spicy dish of Chinese origin which is always a hit with our family and friends. 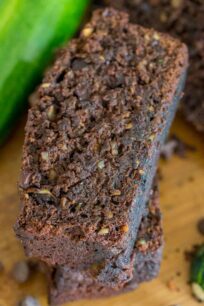 It is made with chili paste instead of peppercorns, which gives this meal a rich and distinct Asian taste. Like many other Chinese dishes, this one is rich and full of flavors, with a spicy and savory taste. It is one of our favorite Chinese dishes because it is fast and super easy to make. 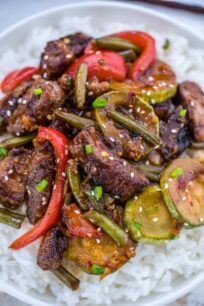 It is basically a beef and veggies stir-fry, with a spicy sauce that is low in carbs, and gluten-free. 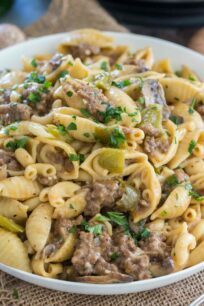 In addition, it is ready in less than 30 minutes, so it’s the perfect recipe to make during busy weekdays. 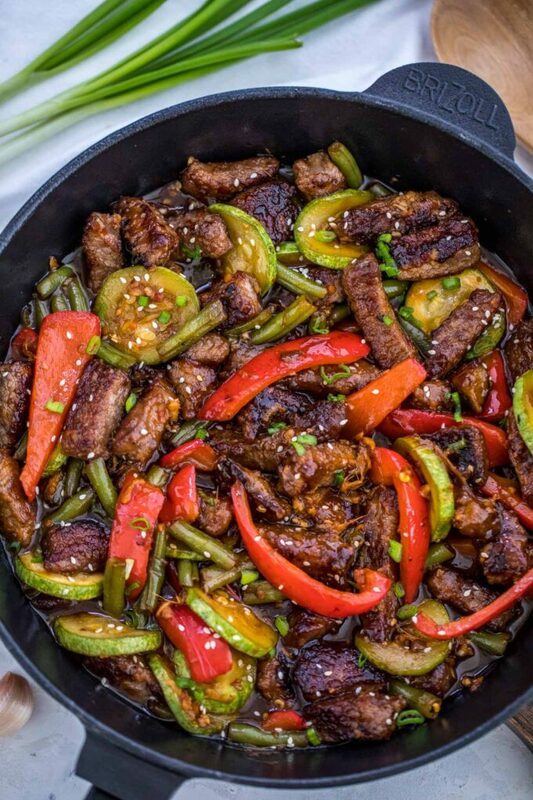 Hunan beef is stir-fried beef spiced with chilies. It is derived from one of the Chinese provinces named Hunan. Being mainly an agricultural province, Hunan offers a wide variety of delicacies made from vegetables and meat. Hunan cuisine is famous for its chilies, and it’s dishes that are mainly hot and spicy. Due to its popularity, this recipe became pretty popular in American and now is served almost in every Chinese restaurant. 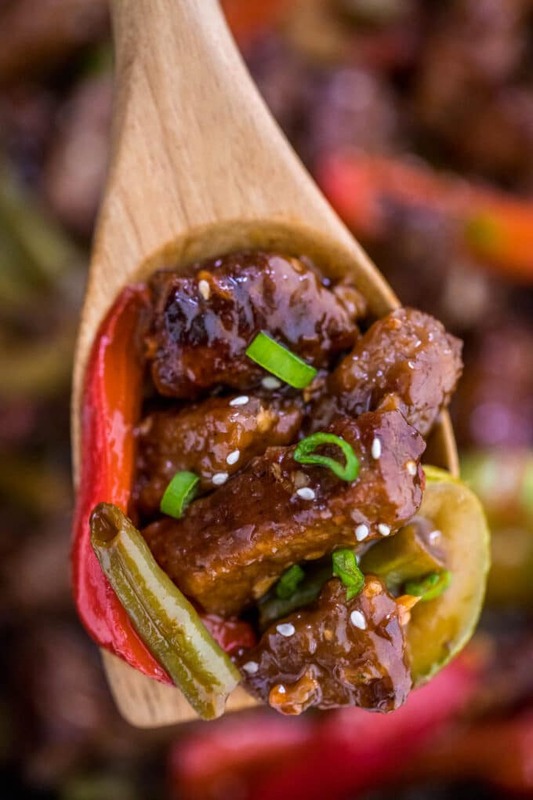 Hunan beef has that sophisticated taste of tender beef, spiced up according to your taste. It is a stir fry recipe, with sliced beef fried in hot oil with veggies, and tossed in a spicy sauce with garlic and ginger. 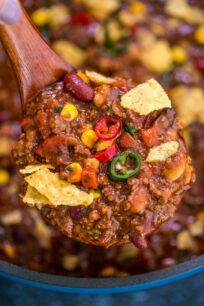 We use chilies in it to give this dish a nice and a spicy kick. However, you can adjust the spiciness according to your tasting, so feel free to add or reduce the chili paste amount per your liking. 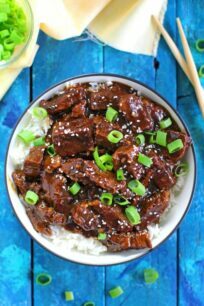 How to make Hunan beef? Making this recipe mainly consist of two parts. First, you prepare the meat and slice it into thin strips. Always try to cut against the grain. Then, put the meat in a bowl and mix it with cornstarch, salt, and some pepper. The second part is the actual frying. In a heated wok or pan, add some vegetable or peanut oil for more flavor. Then, add in the beef and stir-fry for a couple of minutes. Once the meat is browned, remove it from the pan and set aside. In the same heated pan, stir in and cook the veggies after which you add the sauce made of ginger, garlic, your chili pepper or paste of choice, pepper flakes. Cook for a few minutes and then add the meat back to the pan while stirring constantly. 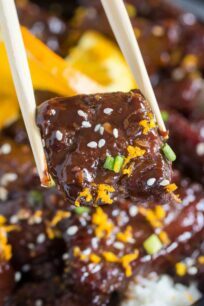 How to store Hunan beef? Prior to storing it in the fridge, ensure that the dish is completely cooled. Then, transfer it into an airtight container and store in the fridge for up to 3-4 days. Leftovers are delicious and pretty easy to heat up the following days. 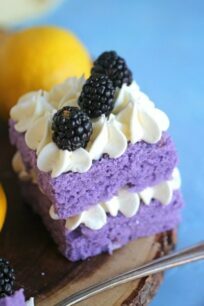 You can also freeze it for a longer period of time. 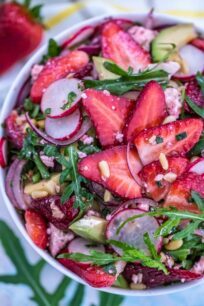 To do so, transfer it to an airtight container or freezer safe dish, and freeze for up to 3 months. Use good quality beef, and slice it thinly and uniformly against the grain. We use flank steak because it’s affordably priced and works perfectly in this recipe. In case you encounter difficulty in slicing the beef into thin strips, we recommend freezing it first for a few minutes. That will do the trick. Also, you can swap the beef with pork meat. Just make sure to also thinly slice the pork meat. 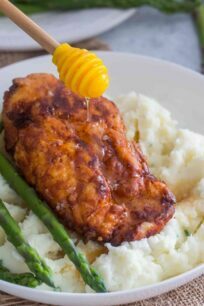 Shoulder or pork tenderloin is a great alternative. If you don’t have a wok, we recommend using a bigger and deeper pan. Since this is a stir fry meal, everything is cooked quickly. Therefore, keep in mind that the cooking process is moving fast, and everything will be ready in 5-10 minutes. Best to serve it over white or brown rice. In a bowl add ¼ cup cornstarch and season with a little salt and pepper. Stir to combine with a fork. Add beef pieces and toss to coat well. Add all the ingredients for the sauce into a small bowl and whisk until well combined. In a large pan over medium-high heat, add vegetable oil. Once the oil is hot, drop beef pieces and cook beef in one layer, do not overcrowd, cook until crispy and golden-brown. If needed cook in batches. Remove beef from the pan and set aside on a plate. Add a bit more vegetable oil if needed to the pan and add the vegetables. Cook for 7-8 minutes, until tender and lightly browned. Return beef to the pan and add the sauce. Stir and coat vegetables and chicken for 1 minute and turn the heat off. 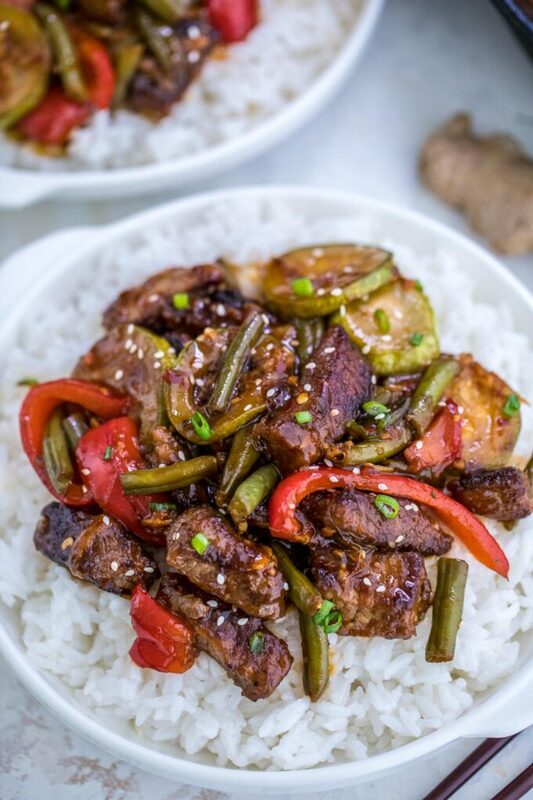 Transfer to a plate or bowl and serve Hunan beef with a side of white rice. Garnish with green onions and sesame seeds before serving.